Can Energy Drinks Damage Your Kidneys? Energy drinks have been successfully marketed as providing a burst of energy and focus for athletes, students and tired office workers. While many of the active ingredients in energy drinks occur naturally in other foods, the high concentration found in energy drinks may be associated with kidney damage. Moderate intake is unlikely to have any ongoing effect on your body, but exceeding the recommended dosage increases your risk, particularly when mixing energy drinks with alcohol or taken after exercise. Most 8-ounce cans of energy drink will contain roughly 70 to 80 milligrams of caffeine. The Food and Drug Administration has determined that moderate caffeine intake -- around 200 milligrams per day -- is unlikely to have any negative health effects, but a high intake of 600 milligrams or more per day could increase your risk of kidney damage. Ongoing overconsumption of caffeine has been associated with chronic kidney disease, according to research published in the "Clinical Journal of the American Society of Nephrology" in June 2009. Drinking one or two cans per day is unlikely to have an impact on your kidneys, but greatly exceeding this amount may increase your risk of kidney damage. Taurine and ginseng are two more common ingredients in energy drinks that are generally harmless in small doses. Research published in 2002 in "Nephrology Dialysis Transplantation" found that the taurine content in energy drinks can cause excessive taurine accumulation in the body in people with existing kidney problems, as the kidneys are unable to filter it from the body effectively. Taken on its own, ginseng has actually been associated with improved kidney function. MedlinePlus notes, however, that when combined with caffeine -- as it is in energy drinks -- it can cause high blood pressure, which can lead to kidney damage. 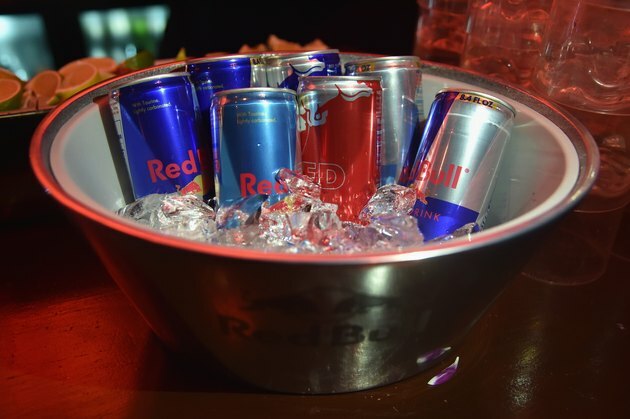 Energy drinks are often combined with alcohol at bars or parties, and this can slow the effect of alcohol on the body. This combination is associated with increased urine output, which can cause dehydration and decreased kidney function. This is particularly common in college students, according to a report from "The Cleveland Stater" at Cleveland State University: Students tend to drink greater amounts of alcohol when mixing it with energy drinks, increasing their risk of kidney damage as a result. According to a paper from the University of California, healthy adults should limit their intake of energy drinks to one can per day, or 8 to 12 fluid ounces, to reduce the risk of developing health complications. If you do choose to have energy drinks, do not take them before, during or after exercise to avoid putting further pressure on your kidneys. The paper also recommends that pregnant and nursing women and adolescents and children avoid them altogether. What Does Red Bull Contain?